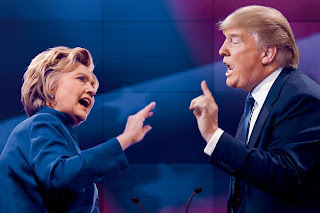 We're one day before the Presidential election in the United States, and I'm sure you know I will not be providing some provocative forecast on who will win the Presidency. In terms of the big picture economic direction for the global economy and financial markets, it does not mater who wins. That statement is made with the understanding Donald Trump is the first candidate I have seen in my lifetime that is not a true politician. Normally I view candidates as the same exact person during election time. Trump has definitely changed that. The person who wins this election will have the opportunity to captain the Titanic after it has hit the iceberg. The pain that is coming for our economy and financial markets has already been baked into the cake. You cannot spend 7 long years drinking alcohol and taking heroin (borrowing and printing money), and then expect to just move on with your life with no consequences based on a new President. The only question now is how long it will take for the Titanic to sink and how it will submerge into the ocean. There is something important about this election, however. It represents another case of an underlying trend toward voting against the establishment forces. Brexit and Trump both represent similar ideas. People can feel something is terrible wrong, even if they don't understand how they are being screwed. Brexit and Trump (should he win) will provide little long term meaningful impact on the direction of the global economy and financial markets. Obviously we know Hillary is just 8 more years of exactly what we have now, so there is little to discuss there. The markets may crash if Trumps wins, but the crash would be based on coincidence, not real world economic causation. The global economic and financial snowbank has already been set for an avalanche; it is just waiting for the a single flake to trigger the decline. The last major financial crisis officially started in February 2007 when two Bear Stearns hedge funds collapsed, but we know now that it was a decade of reckless borrowing and low interest rates that caused the avalanche; not that one snowflake. The underlying trend or social mood against the establishment will soon reach the voting polls in Europe. Unlike Brexit and America's Presidency, those elections actually provide real world economic causation toward the financial markets. Why? If voters in Spain, Italy or France decided to "Brexit" out of the European Union, it will create major dislocations in the interconnected global banking system. You would see both a banking crisis and central bank response similar to Lehman Brothers. Is that the snowflake that will trigger the avalanche? Is it China's ridiculous debt binge and real estate bubble? Is it just a long overdue asset price decline in stocks, bonds and real estate globally? Is it Trump? Is it a terrorist attack? Is it Japan's bond market and currency imploding? It is less important to try and figure out what snowflake will trigger the avalanche and when it will happen. Why? Because no one can determine that. Even the smartest minds on the planet who were shorting subprime bonds back in 2006 had no idea when the decline would begin and what news event would finally trigger the avalanche. They were not focused on the snowflakes, they were focused on the instability of the snowbank. Very well summarized. Thanks for your continuing efforts. Agreed. As always a voice of reason in an unreasonable world.